aka Abies koreana 'Silberlocke' and Abies koreana 'Horstmanns Silberlocke.' 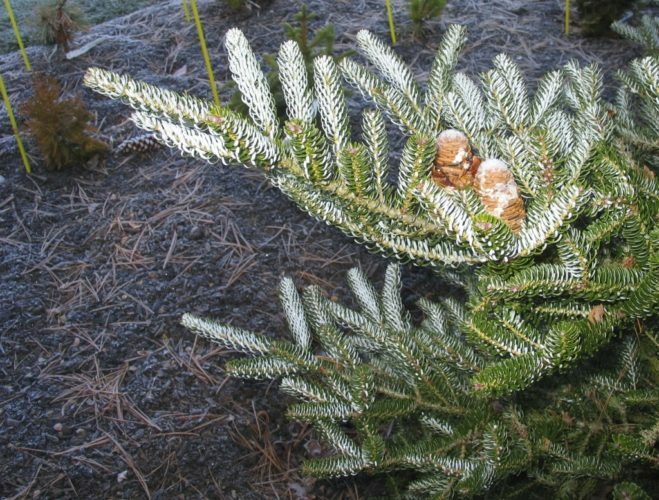 Please note the the Royal Horticultural Society lists this conifer as 'Silberlocke.' The Horstmann family has made their wishes to the nursery trade clear that 'Horstmann's Silberlocke' is the correct name that is to be used. 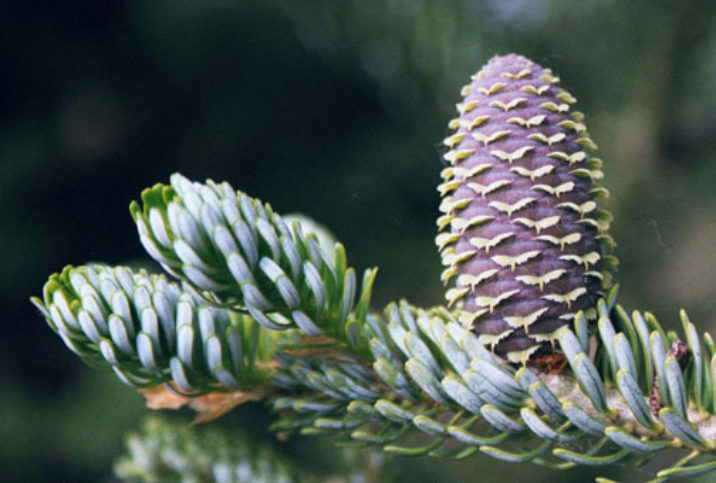 Abies koreana 'Horstmann's Silberlocke' is a beautiful selection of Korean fir. The needles on the branches curl on the tops toward the stem exposing the white underside of the needles, giving the tree a frosted look. Typical rate of growth in most areas is 4 to 6 inches (10 - 15 cm) a year. Over time, 'Horstmann's Silberlocke' will grow into a small tree in the landscape. The curling needle habit seems to lessen with age and if given optimal growing conditions, but will always make a striking impression in the garden. Günther Horstmann of Schneverdingen, Germany introduced this cultivar to the nursery trade in 1979. It entered the record as 'Horstmanns Silberlocke,' but over time, Horstmann's name had been dropped from some nursery listings creating confusion in the trade. 'Silberlocke' and 'Horstmanns Silberlocke' are synonymous. In German, "Silberlocke" translates to silver locks of hair and in German grammar, the possessive case does not use the apostrophe at the end of a surname (Horstmanns in German vs Horstmann's in English), hence some of the confusion. Since the cultivar name, 'Horstmann's Silberlocke' has become ubiquitous and generally accepted in the global nursery trade, that's the construct we choose to maintain at the ACS. 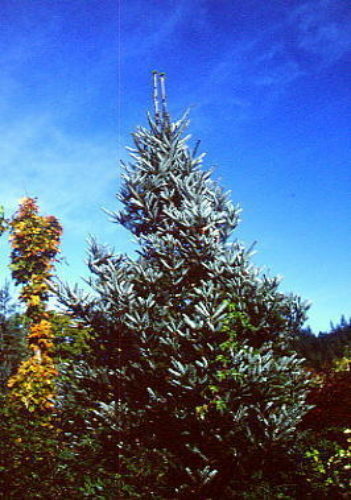 Abies koreana 'Horstmann's Silberlocke' — this photo was taken of a specimen at Porterhowse Farms, Sandy, Oregon in October 2001. Abies koreana 'Horstmann's Silberlocke' — a closeup detailing the frosted effect of the needles. 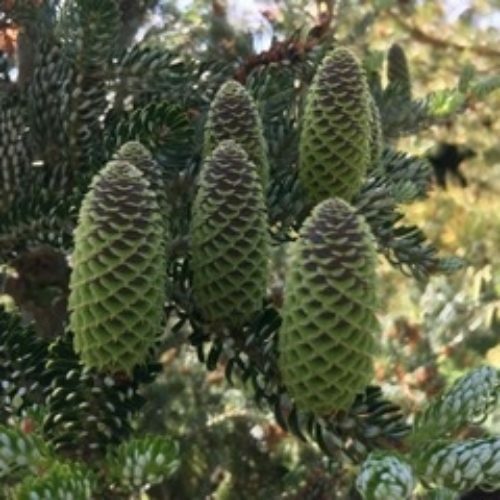 Abies koreana 'Horstmann's Silberlocke' — a mature seed cone. 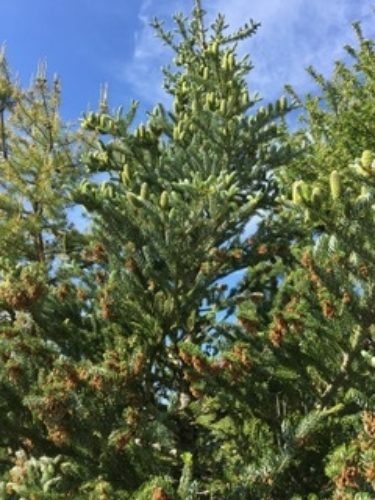 Abies koreana 'Horstmann's Silberlocke' — in some years, seed cones will literally cover the tree. 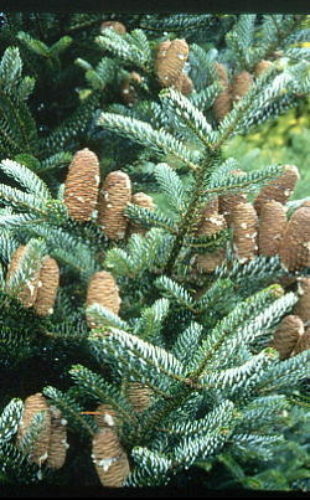 Abies koreana 'Horstmann's Silberlocke' — a closeup of immature seed cones in spring.